1839 The original Academy was built where the Baptist Church is now located but in time was destroyed by fire. 1850 The Union School District was formed and decided to provide a suitable and permanent home for the Academy. 1851 A new building was erected by the district and deeded over to the trustees. 1873 The Academy was leased to the town and school was carried under the Free High School Act. 1875 The bell tower was added as well as a stage area and a room underneath it. 1895 The trustees applied to the Legislature for aid and obtained it and opened a school on April 15, 1895. Students from other towns paid $4 per term and could obtain boarding in town for $2-3 per week. The Academy was placed on the Maine State College list of approved schools. 1966 The last graduating class of Cherryfield Academy. 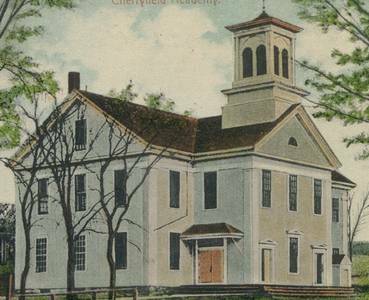 The Cherryfield Town Office and the Cherryfield Library were both housed in the Academy building until 2001 and 2004, respectively. 2001 – The Town deeded the Academy Building to the Trustees.